If you are looking for top-rated and trusted carpet cleaning company in Hale, then Magic Carpet Cleaning is the company to call. We have a team of local carpet cleaners in The Hale HA8 who are just a phone call away from revitalising your carpet looks. Our team of experts use the latest machines in the hot water extraction industry along with mild and safe cleaning products. Dial 020 8861 0979 today to book your professional steam cleaning services with us. You will receive an affordable price quote for top-quality cleaning services for your domestic carpets or rugs. Don’t delay but call us now! One of the first reasons why you should choose the Magic Carpet Cleaning services is that they are top of the line professional carpet cleaners. When you have carpets filled with bad odours left from many sources and a lot of different stains you will never be able to take on the job by yourself. You should then seek the help of the Magic carpet cleaners. If you use the chemicals on the carpet yourself more than likely you would end up damaging the carpets instead of making things better. Get the professionals at Magic carpet cleaners, they have all the solutions to your carpet cleaning woes! 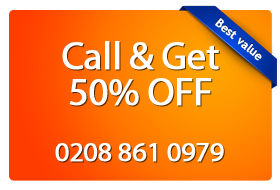 Take advantage of our offers and discounts with a call on 020 8861 0979. Our customer support representatives will take your call and help you with all the arrangements. Upon request, you will receive a free, non-obligation price quote. In case you need to get your service quicker, just send us a message with your info and details. Our team will return a call with an estimate and date and time for our team of professional carpet cleaners to visit your home.